Making lifestyle changes that foster better health include becoming physically active, learning stress management techniques, smoking cessation and a healthy diet. Healthy diets include adding more fruits and vegetables to your daily consumption, switching from refined carbohydrates to whole grains, lowering salt intake, limiting alcohol consumption and lowering fat consumption. One of the best ways to lower fat consumption is to switch from deep fried foods to baked foods. When foods are deep fried in oil, high temperatures cause starches to form Advanced Glycation End Products, or AGE's. Most deep fried foods are coated in breading made of starch while the food being fried may itself be starch, like french fries. These starches meet with the high temperatures required to deep fry them, then react to form carcinogens. A study published by "Molecular Nutrition and Food Research" linked AGE's to a variety of diseases, including diabetes. Further research is needed to determine just how harmful AGE's truly are. Some foods deep fried in restaurants are cooked in partially hydrogenated oil. 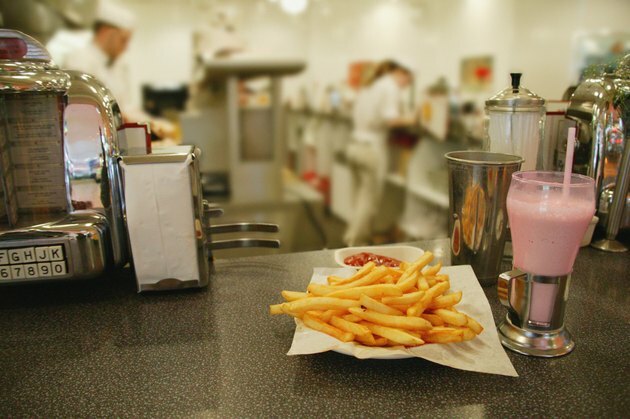 Partially hydrogenated oils, or trans fats, are cheaper to produce, last longer without spoilage, and withstand high temperatures during cooking, making it a highly desirable staple for restaurants to utilize. However, according to Harvard School of Public Health, trans fats are responsible for an estimated 1 out of 5 heart attacks in the United States, cause inflammation, reduce the effectiveness of your immune system, promote obesity and have been linked to multiple chronic diseases, including stroke and diabetes. Oil heated to the high temperatures associated with deep frying starchy foods produces yet another negative effect: oxidation. Oxidized oils are thought to cause many possible health problems including damage to the lungs, kidneys and heart. Palm oil in particular was studied in research published in "Plant Foods for Human Nutrition" in 1999 showed oxidized palm oil adversely affected plasma, free fatty acids and an increased risk of high blood pressure, arterial thrombosis and atherosclerosis. Researchers concluded that reducing oxidized oil in your diet would provide multiple health benefits. Baking requires little or no oil. The oil that is necessary to deep fry food is well-absorbed by the breading or coating that normally covers deep fried foods. Each tablespoon of oil adds 120 calories and 14 grams of fat to your food, and deep frying has to be done at high temperatures which excludes the use of healthy monounsaturated fats like olive oil. Compare the nutritional information of a popular fast food restaurant's chicken legs. Even skinless fried chicken is higher in calories -- a 3.5-ounce serving contains 219 calories, compared to 190 for roasted chicken. There are many healthy cooking options besides baking or deep frying, but when given the choice, baking is much healthier. Other good-for-you options include foods that are steamed, pan fried with non-stick spray, roasted or grilled. Instead of relying on fat to impart flavor, use marinades and herbs to spice up your meal. Simply topping baked chicken breast with lemon juice and black pepper, or marinading beef in a mixture of olive oil, garlic and rosemary before baking makes for a flavorful main course. Are Deep-Fried Foods Harmful to the Health? What Are the Sources of LDL & HDL Cholesterol?